While 11th grader Jamie Epstein chose to tackle an issue that poses personal challenges to many in the Orthodox world, 12th grade Zahava Gersten chose an issue that poses serious challenges to the theological side of Orthodox Judaism for her submission to the Kol Ha-Mevaser Magazine: the conflict between science and Torah. 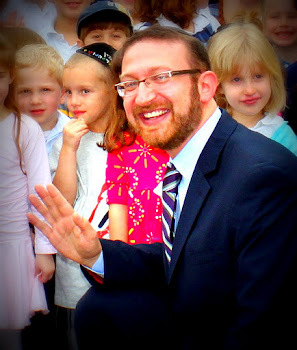 Specifically, Zahava set out to compare how teachers in yeshiva high schools throughout the country approach this issue when they teach the first few perakim of Sefer Bereshit. In doing so she also lays out a rather comprehensive overview of the position her father and our Mashgiach Ruchani, Rabbi Yonason Gersten, takes in a class that has long been a student favorite here in our high schools. Rather than cower in the face of a serious challenge to Torah belief, Zahava responds with a thoughtful and comprehensive look at ways in which this issue can be successfully navigated. It is a common scene in many Jewish elementary schools. A boy is learningHumash, and his rebbe tells him that dinosaurs never existed. Perplexed, the boy asks how this could be true if archeologists had actually found evidence of dinosaurs’ existence by digging up their bones. “Those are elephant bones,” hisrebbe replies. The student is unconvinced. “Wouldn’t the paleontologists know if the bones were elephant bones?” he asks himself. Many Jewish children all over the world learn Bereshit in a simple and clear-cut manner in the early years of their education. They are taught that God created the world in six days, Adam and Eve were tricked by a snake, and the flood covered the entire planet. While it may be necessary to teach young children Bereshit in a very basic manner, once students reach high school, new questions arise. Teachers will be challenged with questions such as, “How can we believe that God created the world in six days if we learned in science class that it actually took billions of years for the world to form?” and “How is it possible for Adam to have been the first person if we learned that many Homo sapiens existed at the same time?” And explaining that dinosaur bones are really elephant bones will not answer those thirsting for a convincing explanation. If this method does not satisfy a student’s curiosity, then what method does? How should a teacher present Bereshit to inquisitive high school students?